Angelini, N., "The Various Definitions of Cyber Crime and its Impacts on Policy Solutions"
Veatch, D., "The Relationship Between Hypersexuality and Human Trafficking"
Nestor Veloz-Passalacqua "Applying Intersectional Policy Design to the Native American Experience: An Analysis of Land Rights and Policy Design"
Seth Neumann, "E-Commerce: A Case Study of San Luis Obispo"
Sheila M., "U.S. Anti-Poverty Policy Failure: A Policy Evaluation"
Sydney T., "The Reality of Equity in a TWI Settingː A Case Study of Parental Power Dynamics"
Annie A., "Institutionalized California Colonialism: Assessing Social Movements Outcome in Environmental Racism and California Policymaking"
Adria A., "Host and Initiating Agencies of U.S. Food Policy Councils"
Christina L., "A Stakeholder Assessment of the Implementation of the Affordable Care Act"
Stephen S., "Community Building, Political Efficacy, and Adolescents at the California Conservation Corps"
Jill V., "The Actual and Perceived Barriers of Sexual Victimization of Undergraduate Women at Cal Poly, San Luis Obispo"
Congratulations to MPP student, Bryan Pride ('14) who represented the College of Liberal Arts in the 25th Annual CSU Research Competition at CSU East Bay in Hayward, CA on May 3rd. Bryan competed in the graduate student category of Social and Behavioral Sciences. His presentation was based on an independent study project he embarked on with Professor Shelley L. Hurt. The project is entitled, "Becoming Food Secure: How Corporate Farms Create Food Insecure Communities in Developing Countries." The entire department of Political Science is extremely proud of Bryan's accomplishment. 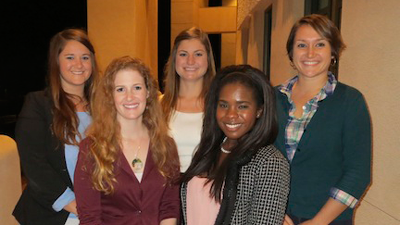 MPP Student, Annie Aguiniga ('15), is featured in an online magazine BCA FYI that features recent business news. Check it out here! Congratulations to MPP student, Matthew Durham, who has been selected as the 157th Franklin Fellow in the U.S. Department of State. Matthew is serves in the Foreign Affairs Office and as a Technical & Policy Advisor with the State Department's Bureau of Arms Control, Verification and Compliance within the Office of Verfication & Transparency Technologies. The prestigious Franklin Fellowship allows Matthew to spend time in the Washington, DC area in this public service role. Congratulations to MPP student, Bryan Pride, who has been accepted to the summer 2013 internship program with The Washington Center!! Bryan plans on working in the area of international environmental policy, particularly global air pollution and climate change, while in Washington, DC. For more information about the terrific graduate internship opportunities provided by The Washington Center, please click here. Llanee A. "Demographics and Group Composition: The Effects of Social Learning on Hate Crime Perceptions"
Emily L. "Investigating the Impacts of Incentives on Consumption: Paper, Plastic or Reusable?" Taylor R. "Urban Displacement in Gentrifying Neighborhoods: A Statistical Analysis of New York City's Housing Characteristics"
Melissa S. "Legislative Barriers to Wetland Policy Reform in California"
Meagan W. "Assessing the Effectiveness of the Williamson Act on Farmland Preservation in California"
In Preparation for the 2013 Western Political Science Association conference, the MPP and POLS faculty and students came together for a workshop about academic conferences on Tuesday, March 5th as part of the POLS Department's "How Does It Work?" series. As part of the workshop, Dr. Craig Arceneaux, Dr. Shelley Hurt, Dr. Mike Latner, Dr. Elizabeth Lowham, and Dr. Derek Reiners shared their perspectives on conferences, their experiences with them, and offered practical advice to students who are participating in or interested in attending a conference. This 90-minute workshop involved several presentations, including a detailed overview by Dr. Arceneaux, and some constructive suggestions for success from Dr. Hurt. It also included a terrific presentation from MPP student Llanee Anderson, who will be presenting a paper at the Western Political Science Association's annual meeting in March. 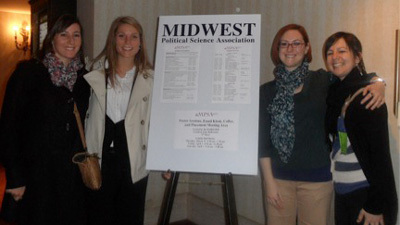 Llanee presented her research on hate crimes to a mock panel consisting of faculty members, Dr. Lowham and Dr. Latner. 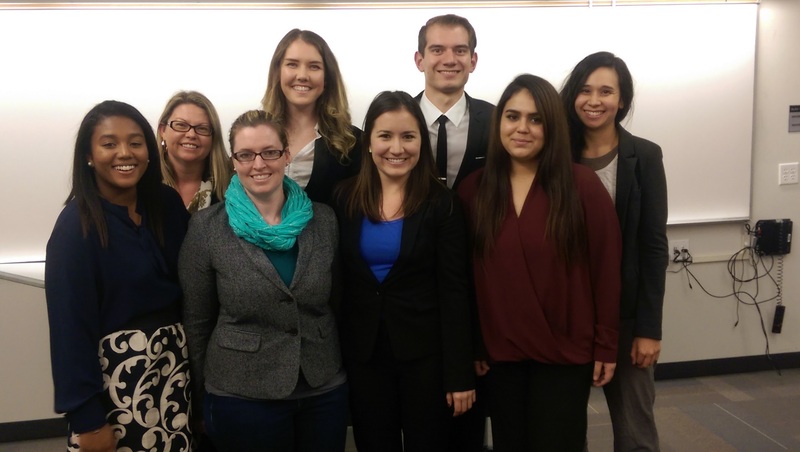 The panel provided feedback on Llanee's presentation and offered suggestions and ideas for improvement before the 2013 Western Political Science Association Annual Conference. Great job, Llanee! April W. "Electric Town Hall"
Liz M. "Does Collaborative Decision Making Lead to Improved Outcomes?" Torrance H. "Post 911 Senate Voting Motivations on Intelligence Spending"
Cheryl H. "The Architecture of Beliefs"
Cecilia M. "Do Extra-curriculars Matter?" Tina S. "Predicting Teenage Pregnancy Rates"
Casey W. "Are School Boards Democratic Duds?" Chris L. (2010) “Provincial Reconstruction Teams and their Effectiveness on Stability Operations in Afghanistan” as part of a panel on External Involvement in Conflicts.